I am unsure how to introduce these pictures. I do not know the occasion, I cannot really say it is a reunion. I do not know which family really pulled this together or why, I do not know at whose house the reunion took place. It seems like an impromptu gathering of the Neilson family, but yet there are Coley’s present. Maybe the Coleys came to visit so the Neilsons all gathered too? But then there is the unknown woman. Is she related to the Neilsons, a distant relative of the Coleys, or both (since Edna Neilson, Art Coley, and Golden Coley are siblings with their mother Martha present). 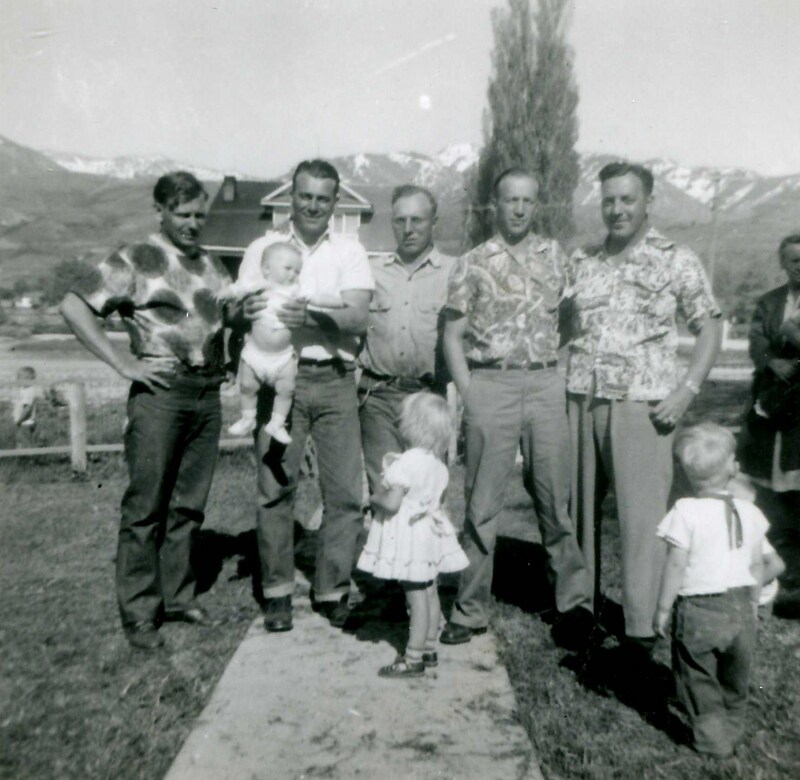 About all I have been able to determine at this point is the pictures are believed to have been taken in Richmond, Cache, Utah in about 1950. We venture to guess sometime in the early spring due to the snow still on the mountains. 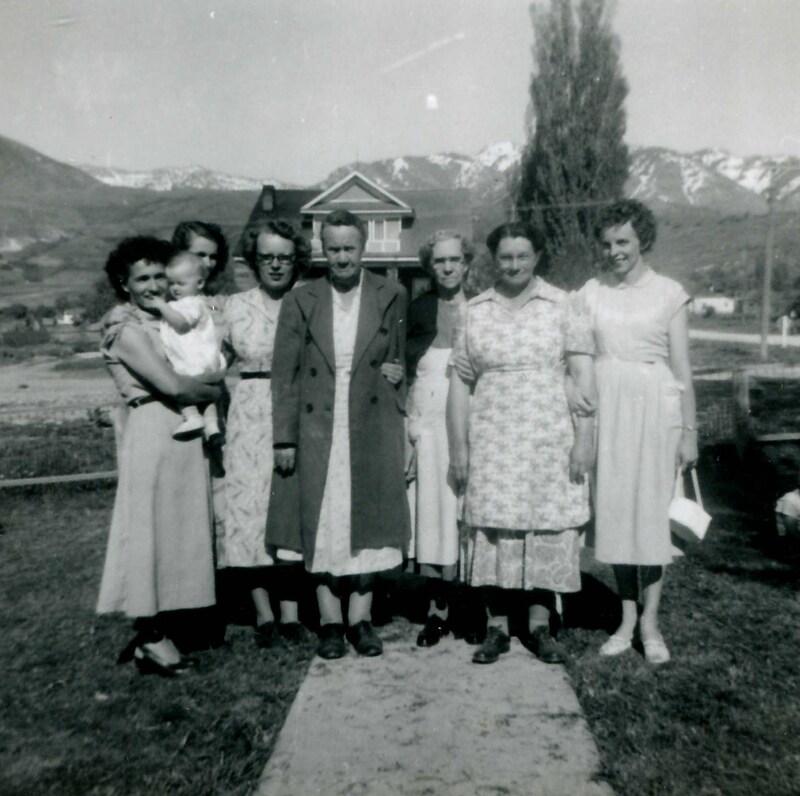 Back(l-r): Doreen Neilson, Martha Coley, Golden Coley, Edna Neilson, Unknown, Gloria Neilson holding unknown child, Olof Neilson. Middle: Shirley Coley, Joy Coley (baby), Mary Coley, CarolDean Neilson, Harold Neilson, Russell Neilson. Front: Unknown, Charlotte Neilson, Steve Coley, Arlan Neilson, unknown (boy sitting apart). Martha Christiansen Coley (1879-1961) is the widow of Herbert Coley(1864-1942). Edna Coley Neilson (1900-1983) is the daughter of Herbert and Martha Coley. Olof Alma Neilson (1891-1960) is the husband of Edna Coley Neilson. Harold Christian Neilson (1921-1966) is the son of Edna Neilson and Gerold Andrus (1903-1984) but was raised by Olof Neilson (you can read more under the above link for Edna). 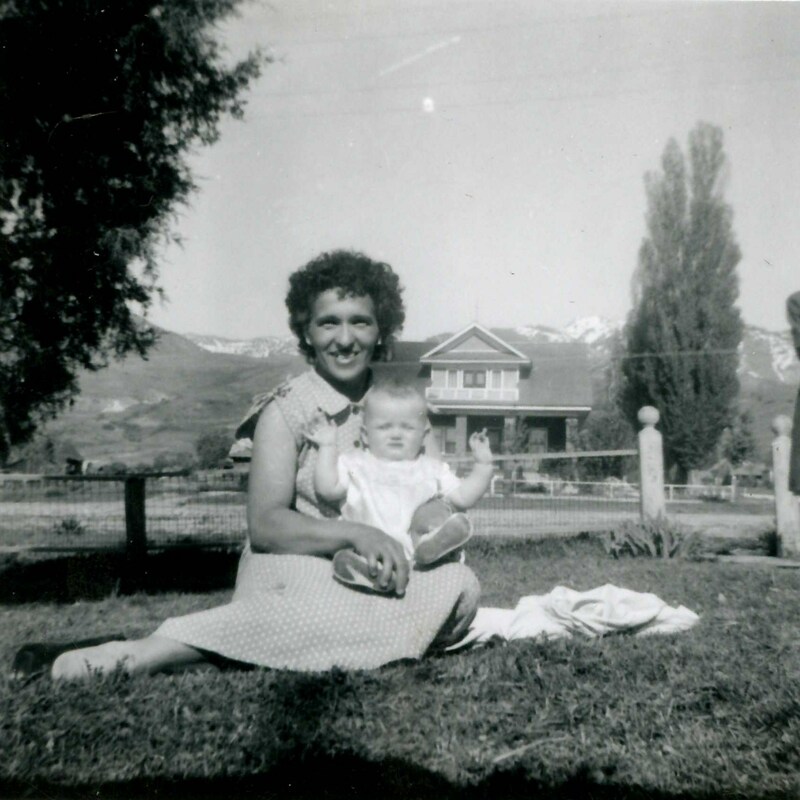 Oma Dorine (Doreen) Johnson Neilson (later O’Neil)(1921-2003) is the wife of Harold Neilson. Charlotte, Arlan, and CarolDean are all children of Harold and Doreen Neilson (although my records show none of these were born yet, but I have not been able to validate their birthdays). Alma Russell “Russell” Neilson is the son of Olof and Edna Coley. Gloria May Olson Neilson is the wife of Russell Neilson. 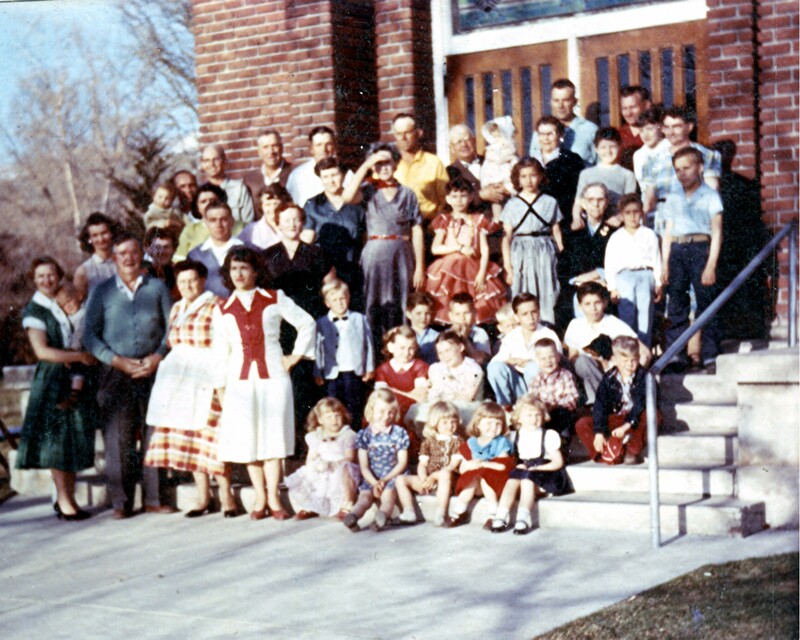 I presume some of the unknowns in the photo are their children, but have not obtained that information yet. Arthur “Art” Christiansen Coley(1921-2004), not in the above picture but below, is the son of Martha Coley. Mary Elizabeth Popwitz Coley is the wife of Art Coley. Stephen “Steve” G Coley is the son of Art and Mary Coley. William Golden “Golden” Coley (1924-2009) is the son of Herbert and Martha Coley. Shirley May Hall Coley is the wife of Golden Coley. Joy Ann Coley is the daughter of Golden and Shirley Coley. If anyone has contact with any of Harold or Russell’s children, I would like for them to see the pictures and perhaps provide more information. 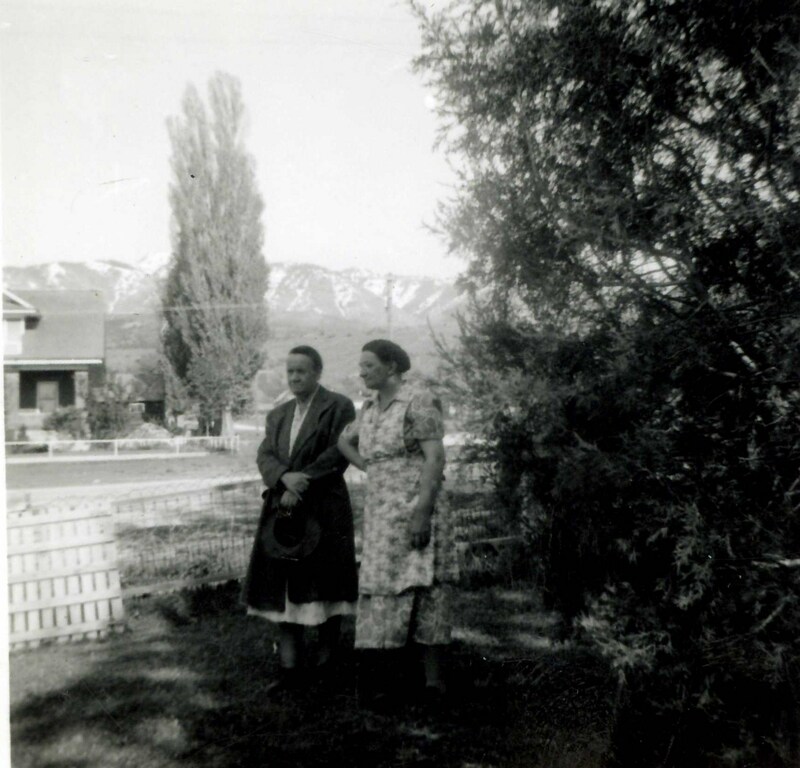 Above you can see Edna Neilson with the unknown lady who appears to be part of the reason the family assembled. Unfortunately, we do not know who the guest of honor is! Initially I thought it was some relation of the Neilson clan, but nobody alive in their family seems to know who she is. But then why would Martha Coley and two of her other children’s families come to visit a Neilson visitor? Perhaps a sibling or sibling in law of Martha? Who knows? Hopefully some day I can find out and rewrite this post. Here are the boys present on the occasion. Here are the girls present on the occasion. Since I presume these photos were all from Art and Mary’s camera, of course there is a picture with Mary and Joy. One last picture of part of the elusive woman with Harold and his two children, Arlan and CarolDean. Back (l-r): Blaine Thomson, Olof Neilson, Lloyd Coley, Ivan Coley, Art Coley, Golden Coley, Lillian Bowcutt, Hannah Thomson, Gay Coley, Betty Coley, Edna Neilson. 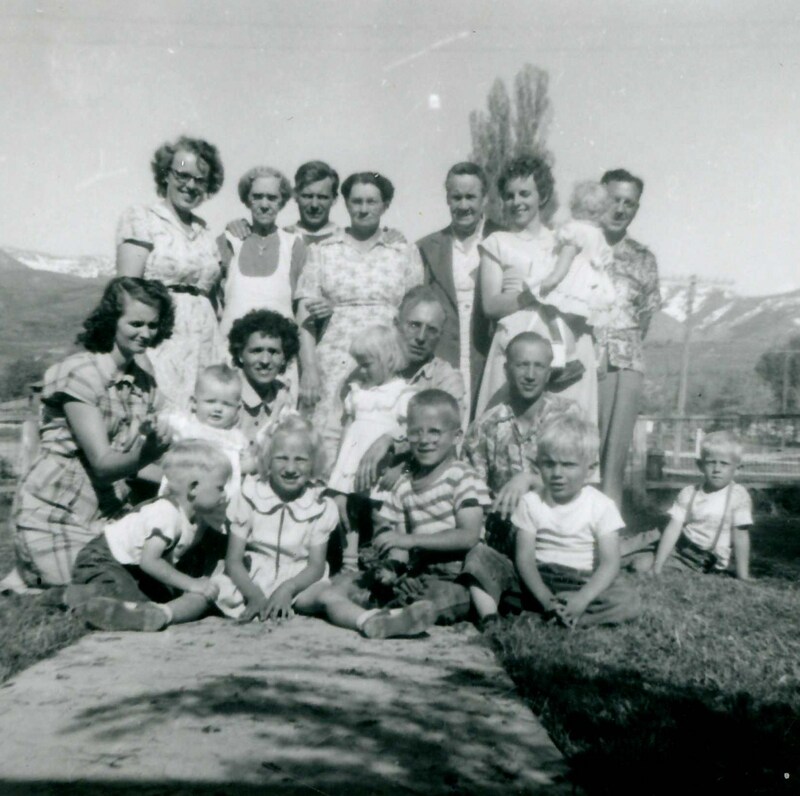 Middle: Verda Coley, Carrie McMurdie, Clara Coley, Bill Thomson, Kathy Coley, RaNae Coley, Martha Coley, Gary Coley, Dean Coley, Stephen Coley. Front: Shirley Coley, Lillian Thomson, Mary Coley, Janice Coley, Joy Coley, Nina Coley, David Coley, Susan Thomson, Doug Thomson. Back: Blaine Thomson, Olof Neilson, Lloyd Coley, Ivan Coley, Bill Thomson, ? (child held by Bill), Hannah Thomson, Gay Coley, Betty Coley, Edna Neilson. Two men in front of doors: Art Coley, Golden Coley. Second row from back: ? (held child), ?, ? 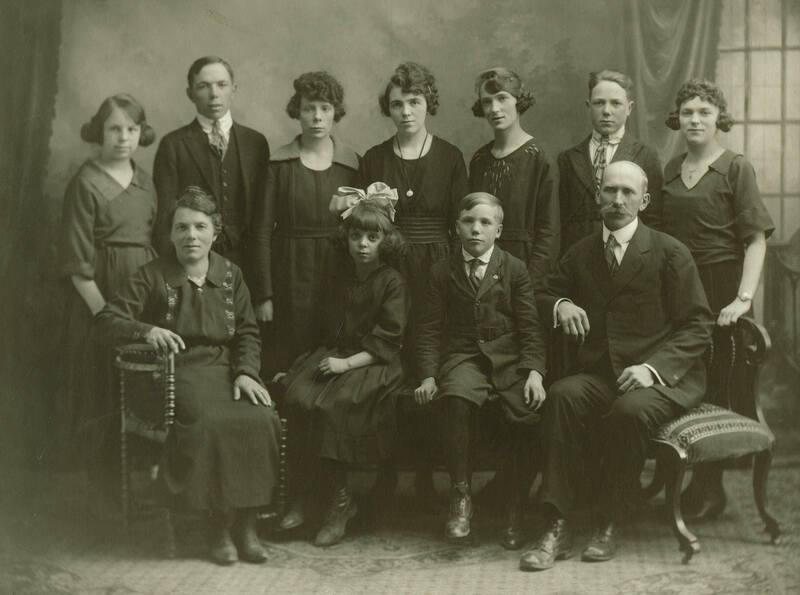 (partially obscured woman in front of Blaine), Verda Coley, Carrie McMurdie, Clara Coley, RaNae Coley, ?, Martha Coley, ?, Steven Coley. 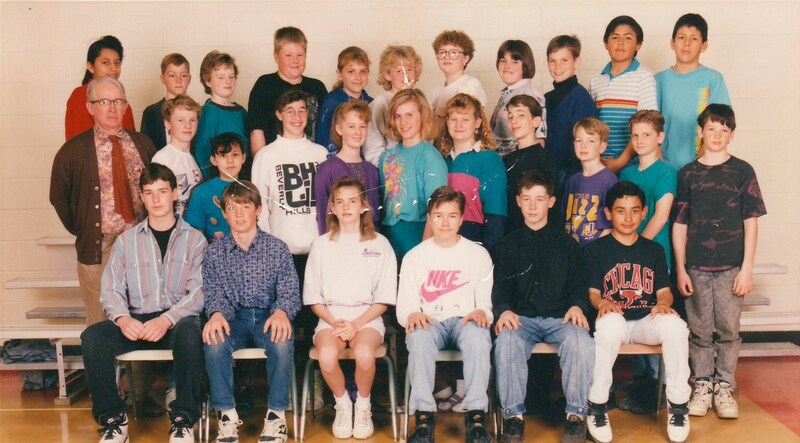 Second row from front standing: Shirley Coley, ?, Evan Jonas, Lona Jonas, ?. Back row of sitting children: Dean Coley, Gary Coley, David Coley (partially hidden), Stephen Coley, Bob Jonas. 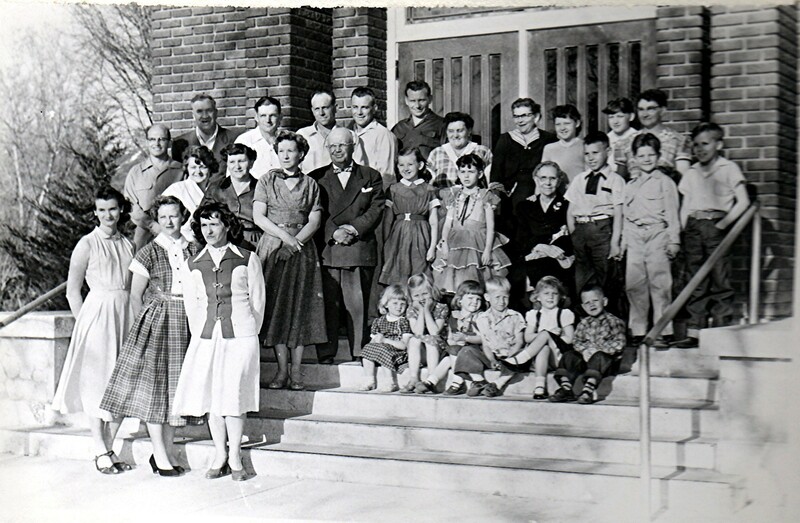 Second row of children sitting: Kathy Coley, ?, Doug Thomson, ?. Front row: Lillian Thomson, ? (child held by Lillian), Ren Bowcutt, Lillian Bowcutt, Mary Coley, ?, Joy Coley, Janice Coley, Nina Coley, Susan Thomson. Now comes the fun part of linking everyone together. I will only link together those in the photo, so this is not the entire family. Martha Christiansen Coley (1879 – 1961). Lillian Coley Jonas Bowcutt (1898 – 1987), daughter of Martha, married to Ren Bowcutt (1883 – 1966), previously married to Joseph Nelson Jonas(1893 – 1932). Evan Reed Jonas (1928 – 1999), son of Lillian, married to Lona Rae Jensen Jonas (1930 – 2012). Edna Coley Andrus Neilson (1900 – 1983), daughter of Martha, married to Olof Alma Neilson (1891 – 1960). Carrie Christiansen McMurdie (1906 – 1992), daughter of Martha, married Joseph Lorus McMurdie (1905 – 2000). Hannah Marie Coley Thomson (1909 – 1982), daughter of Martha, married to William Surgeoner Thomson (1903 – 1985). William McBlaine Thomson (1928 – 2001), son of William and Hannah, married to Lillian Moss Thomson. Susan and Doug Thomson, children of William and Lillian Thomson. Ivan Stephen Coley (1912 – 1994), son of Martha and not pictured, married to Clara McMurdie Coley (1914 – 2012). Clarene RaNae Coley, daughter of Ivan and Clara. Oley Lloyd Coley (1918 – 1998), son of Martha, married to Verda Anderson Coley (1918 – 2013). Arthur Christiansen Coley (1921 – 2004), son of Martha, married to Mary Popwitz Jonas Coley. Stephen Coley, son of Art and Mary Coley (Is Ronald Gary in the photo?). 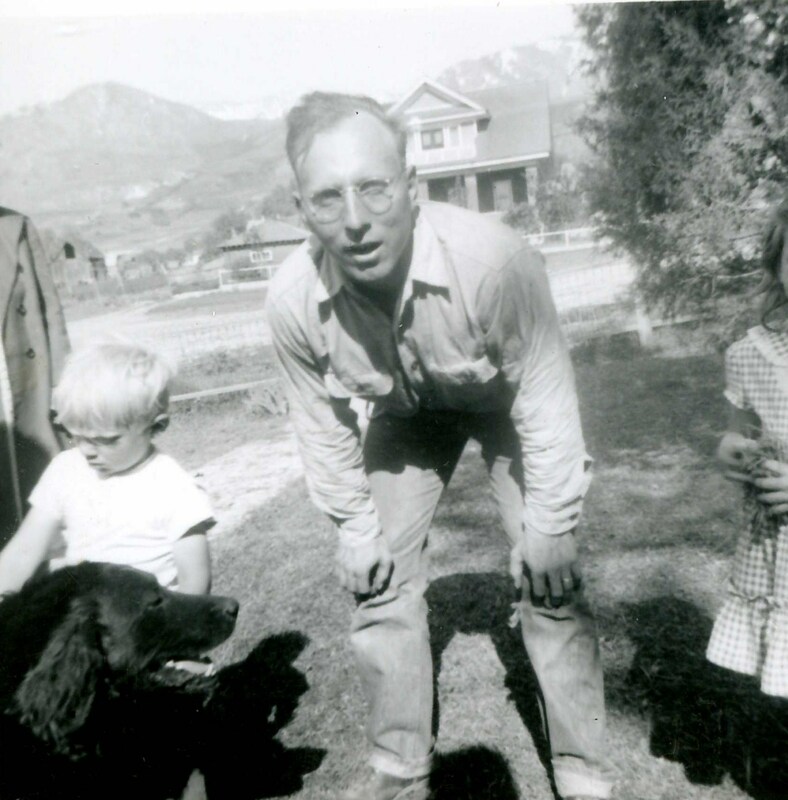 Bob Jonas, son of Irwin John Jonas (1921 – 1944, son of Joseph Nelson Jonas and Lillian Coley Jonas Bowcutt) and Mary Popwitz Jonas Coley. William Golden Coley (1924 – 2009), son of Martha, married to Shirley Hall Coley. Shirley Kathleen (Kathy), Joy Ann, David Lynn, and Janice Coley, children of Golden and Shirley Coley. Do you know the ? individuals in the photo, if so, please let me know.